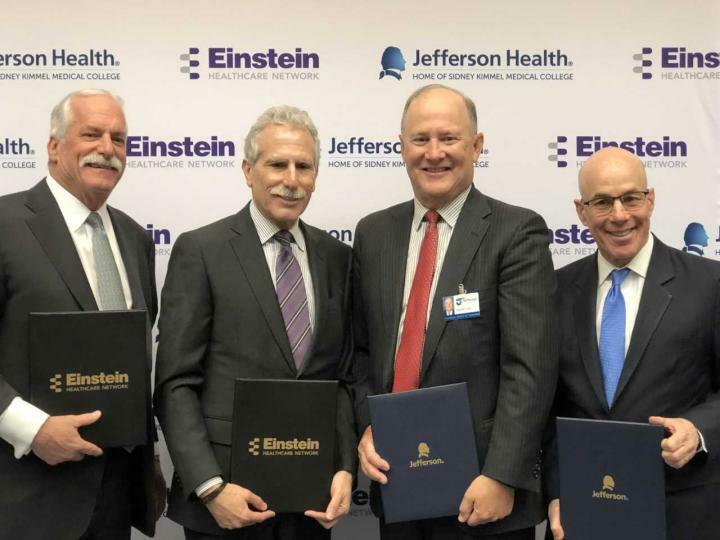 Leadership from Jefferson and Einstein Healthcare Network announced today the signing of a non-binding Letter of Intent (LOI) to merge, potentially bringing together two historically linked academic medical centers whose shared vision is to improve the lives of patients and their communities. The move also sets the stage for a clinical academic enterprise that would boast the largest residency program in the Greater Philadelphia region, making Jefferson (Philadelphia University + Thomas Jefferson University) uniquely positioned to educate the brightest healthcare professionals of tomorrow with a multi-hospital clinical rotation unlike any other. The merger would also bring together nationally recognized MossRehab and Magee Rehabilitation, two of U.S. News & World Report's top-ranked rehabilitation hospitals. "At the new Jefferson our mission is to improve lives. To bring Einstein, with its history, quality and values, into the family brings us closer to that goal," said Stephen K. Klasko, MD, MBA, President and Chief Executive Officer of Thomas Jefferson University and Jefferson Health. "As two academic medical centers that have embraced a no-limits approach to a very different future, we are a perfect match." Under the leadership of President and Chief Executive Officer Barry R. Freedman, Einstein has maintained a deep and abiding commitment to the communities it has served for more than 150 years, while also expanding into new areas including Elkins Park, the construction of Einstein Medical Center Montgomery in East Norriton in 2012 and the development of a dozen outpatient care centers throughout the region. "This merger would enable Einstein to continue living its mission of providing high-quality care with humanity, humility and honor, and also provide opportunities for growth and expansion currently out of the organization's reach," Freedman said. "Both Jefferson and Einstein are aligned in our belief that together we can redefine how patient care is delivered, how health professionals are educated, how research discoveries are brought to patients, and how the health of our communities can be improved." The proposed merger marks a new chapter for the decades-long academic relationship between Jefferson and Einstein. Einstein Medical Center Philadelphia is the largest independent academic medical center in the region, and the Network trains more than 3,500 health professional students and 400 residents in more than 30 programs each year. Jefferson and Einstein will enter a period of due diligence during which time each of the organizations will take a closer look at various aspects of the other. If both organizations decide to move forward, they will sign a Definitive Agreement, and seek all necessary regulatory approvals.